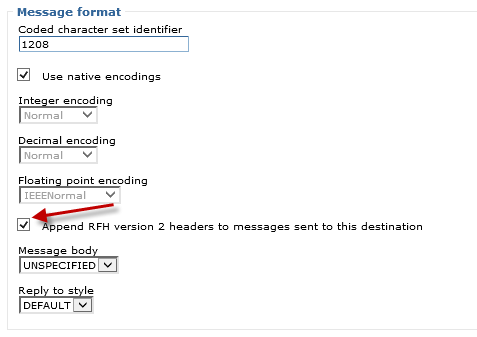 To enable or disable RFH version 2 headers. In the left panel of the WebSphere web console, expand Resources > JMS. Check Append RFH version 2 headers to messages sent to this destination and select OK.
After the application server has been restarted, ensure the SystemOut.log contains “open for e-business” and “Binding queue_name as jms/mq/queue/queue_name” to ensure the application server is up and running and that the queue was bound.